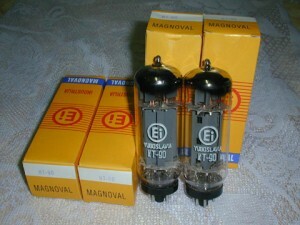 This entry was posted in Vacuum Tubes and tagged Ei, KT90 by tubemaze. Bookmark the permalink. Great sounding tube, which is considered to be one of the very best of all KT90 tubes and could be used in the majority of 6550 and KT88 tube amps. Superbly transparent and dynamic – taking about dynamic, the tube has a phenomenal punch that is very similar to Mullard EL34 with metal base. If you want a power punch, this power is it, but this tube comes short when midrange is considered – it’s very upfront, but not sweet and relaxed as Mullard or Genalex (even reissue). Great tube for rock, but not the best for vocal Jazz.